FILE - An American hostage is paraded before a crowd outside the U.S. Embassy in Tehran on Nov. 9, 1979. They were taken hostage by Iranian student revolutionaries at the U.S. Embassy in Tehran in November 1979 and held for 444 harrowing days laced with interrogations, beatings, solitary confinement and mock executions. Now, 35 years later, dozens of Americans and their families still seek redress for their suffering. Many remain frustrated and impatient – not only with the Islamic Republic but with the U.S. government. In a sense, it’s as if they’re still held hostage, several former captives suggest. From Iran, they say they want – but don’t really expect – a formal apology acknowledging they and their country were wronged. "There’s never been accountability from the Iranian side. They’ve just been in denial," said former State Department diplomat John Limbert, one of the 52 Americans held hostage and among four interviewed by VOA for this report. From the United States, they want support for reparations – blocked for years by the government’s refusal to violate the treaty that freed them. "That’s not exactly what I expected when I was sitting in a cell" in Tehran, said David M. Roeder, now a retired Air Force colonel. While that official opposition has since given way to support for new routes to compensation, some former captives aren’t counting on it anytime soon. They’ve experienced ups and downs before. Some were buoyed by last fall’s cordial phone call between the U.S. and Iranian presidents. But months later, they bristled at Iran’s appointment of a United Nations envoy, Hamid Aboutalebi, who’d served as a translator during the hostage crisis and was suspected of aiding in their detention. Sixteen of them voiced their objections in a teleconference arranged by government representatives — and were relieved when the White House denied a visa for Aboutalebi, effectively barring his participation at the U.N.’s New York headquarters. Former hostage Kevin Hermening chafes at the ongoing talks between Iran and six world powers – including the U.S. – over Iran's controversial nuclear program. "Watching this farce of negotiations with Iran continues to open old wounds," said Hermening, who closely follows any Iran-related news. "Just when you think it’s been put behind you, they rub it raw again." Now a certified financial planner, Hermening was a 20-year-old Marine guard at the embassy when student radicals – angered with the stance the United States had taken in the overthrown Shah Mohammad Reza Pahlavi – seized control on November 4, 1979. They took 90 hostages, including 66 Americans. They soon released all but 52 embassy staffers, mostly civilian diplomats and military personnel. Kevin Hermening, second from front, was among the Marines held hostage in Iran. 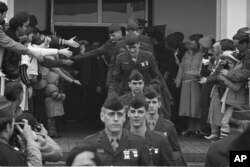 On their way home, they’re shown leaving Wiesbaden Air Force hospital Jan. 25, 1981. For 14 months, the young Marine and many of the others endured interrogations, beatings and more brutality. Hermening recalled being pistol-whipped, and having his hands and feet bound. After a failed escape attempt, he spent 43 days in solitary confinement. Roeder was eight days into his job as Air Force assistant attaché when the embassy fell. His captors repeatedly whipped him with rubber hoses, held guns to his head and once chained him, exposed to biting cold and snow, for more than two days, he said. "The physical stuff got your attention," Roeder said. But the psychological warfare struck at his core. "They threatened to kill my handicapped son and send pieces to my wife because I wouldn’t answer questions during interrogation," Roeder said of his captors, who he believed had arranged surveillance of his family, then in northern Virginia. "I can probably forgive the Iranians for what they did to me," he said. "... I can’t forgive them for that, which is why I’m such a big proponent, if there’s going to be any compensation, that the wives and children receive it. They’re the heroes." The hostages finally were freed on January 20, 1981, through a set of agreements that, they learned, barred them from suing Iran over the ordeal. Some of the former hostages eventually did sue under a 1996 law they believed gave them an opening. Roeder was the named plaintiff in a suit filed in 2000 seeking punitive and compensatory damages from Iran. But when a trial court scheduled a hearing in 2001, the U.S. government intervened. It called for the case’s dismissal, saying it would abrogate terms of the so-called Algiers Accords and compromise the government’s ability to conduct foreign policy. The hostages’ legal team took the case all the way to the Supreme Court, which rejected an appeal in May 2012. A Senate bill introduced last year would grant the former hostages $4.4 million apiece through a surcharge on fines paid for violating U.S. sanctions against Iran. While the Justice for Former American Hostages Act has bipartisan support, it has yet to reach a floor vote. But the move for compensation now has the State Department’s backing. "We are committed to working with members of Congress to explore options for providing the former hostages with additional compensation consistent with our nation’s foreign policy and national security interests," a State Department official wrote in an email response to VOA questions. The official said the department believes the bill "aims to achieve those goals." The e-mail noted the U.S. government already had provided some compensation. In the 1980s, each hostage received a cash payment of $22,000, or $50 for every day of captivity, similar to previous treatment of U.S. prisoners of war. The e-mail also repeated the stance that, because of the Algiers Accords, the government would not support "any claims by the former hostages against Iran in U.S. courts. While the [State] Department understands the former hostages’ frustration, the United States is bound by this commitment." Alan M. Madison, spokesman for the hostages’ legal team at the Virginia law firm of Lankford & Reed, said it is in "serious conversations" with senior State Department and congressional officials. "Everyone is supportive. They’re trying to figure out how to do this," Madison said, noting discussions over timetables, dollar amounts and funding sources. The hostages’ earlier lawsuit, for instance, had sought compensation from frozen Iranian assets. A scholar of no-fault compensation systems, Arizona State University law professor Betsy J. Grey, called funding plans like this "a terrific idea." The ex-hostages have had their doubts about that backing. "All of the [U.S.] administrations for the last 35 years have represented the interests of Iran over the interests of Americans," said Hermening, who twice was a Republican candidate for Congress in Wisconsin. "Iran has never paid a price in dollars or in blood for having violated every tenet of international law." Don Cooke, who retired from the Foreign Service in 2012, said several months ago that the hostages’ "quest for compensation would end tomorrow if the State Department would change its mind." He called its adherence to that position "an excuse," not a reason. He’s still suspicious of Iran, as he wrote in a Washington Post opinion piece. But he recently described himself as "optimistic" about a resolution for the ex-hostages. As he said, "There’s stuff being done now." The passage of time increases the urgency for a deal, said Limbert, noting that only 39 of the 52 former hostages survive. Limbert, who now teaches international affairs at the U.S. Naval Academy in Maryland, said that in closing off access to reparations for years, "our own government has made common cause with the Islamic Republic. They wouldn’t admit to that, but it’s what has happened, in effect." He’s critical despite his long career at the State Department and his deep connection to Iran. "I was in the Peace Corps there in the '60s," he said. "My wife is Iranian, my children are half Iranian." But, as a diplomat, he sees potential – for the ex-hostages’ cause and for some kind of relationship between the United States and Iran. "Look, I’m always hopeful," Limbert said. "You have to believe eventually things will get better. You can’t deny we’re in a very different place than we were a year ago. For 34 years, we bashed each other, we insulted each other, we threatened each other. We have to do something different."